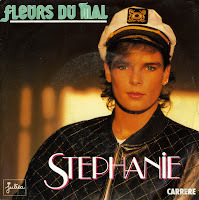 Princess Stephanie from Monaco appeared on this blog before with singles from her debut album, released in 1986. It was a rather successful album in some parts of Europe, so she went about recording a follow-up. Unfortunately, that took such a long time that the music scene had totally changed in the mean time. That self-titled second album was finally released in 1991, with the lead single 'Winds of chance' failing to reach the charts. 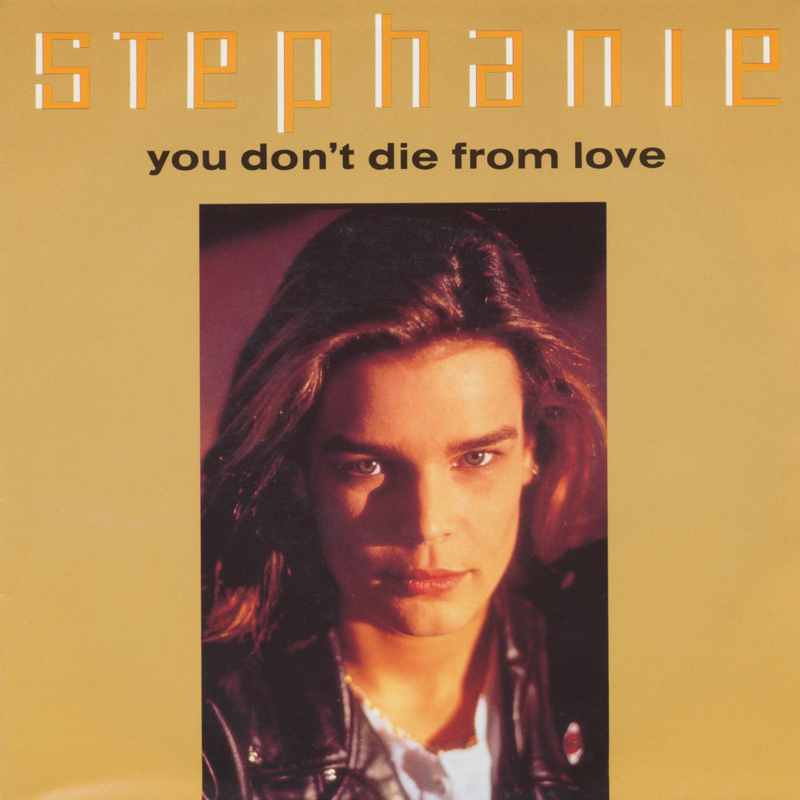 This single, 'You don't die from love' was the second and last single to be released by Stephanie. She did appear on Michael Jackson as the mystery voice on 'In the closet', but after that, her music career was over and done. 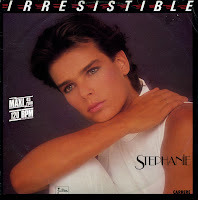 Princess Stephanie from Monaco made a name for herself as a singer with the 1986 hit 'Ouragan' / 'Irresistible', and on the back of that success released an album of reasonably good pop songs. But royalty is almost obliged to do something for charity as well, and so one of the tracks from the album ended up being connected to Unicef in 1987. 'Young ones everywhere' was the appropriate title of the single, and it announced in large letters 'Stepahnie for Unicef'. It is not known whether this single raised a lot of money for Unicef, but since it wasn't a Europe-wide hit, the worst is to be feared. At the turn of the year I saw Stephanie in the audience of the annual Circus show from Montreux. She looked a bit old, much older than when she released her debut album back in 1986. That's logical, I guess. Back in 1986 the old comment 'she looks better than she sings' was very much in play. I wonder if that is still the case right now. Anyway, I have most of the singles from that debut album, but this one is a rarity: a promotion single released in Germany, featuring both the English and French versions of the song 'Flash'. 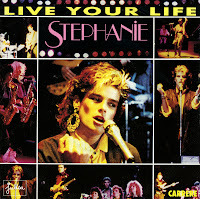 This 7" single of 'Live your life' is different from an earlier release, which features the album version of the track. This one features a dance remix, created by one Dimitri and clocking in at 5'17. The B-side is different too: it features the album track 'Besoin', which appears on Stephanie's debut - and only - album. The sleeve of this single features images of a music video filmed at Playa de las Americas in Tenerife, according to the information at the back. When an artist records two versions of a song, one in French and one in English, it's quite easy to make an extended remix: you just use the verses of both versions and before you know it the song is about seven minutes long. 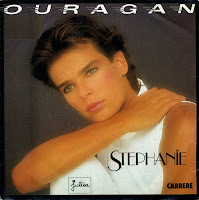 That's what happened with Stephanie's 'Irresistible', which she also recorded in French as 'Ouragan', on this 12" single. Fortunately, there are also a few interesting instrumental passages, but the whole thing is not very imaginative. Still, like all the material from Stephanie's debut album, it's pleasant enough to listen to. It's always weird to find a single not intended for the UK market in a shop in the UK. 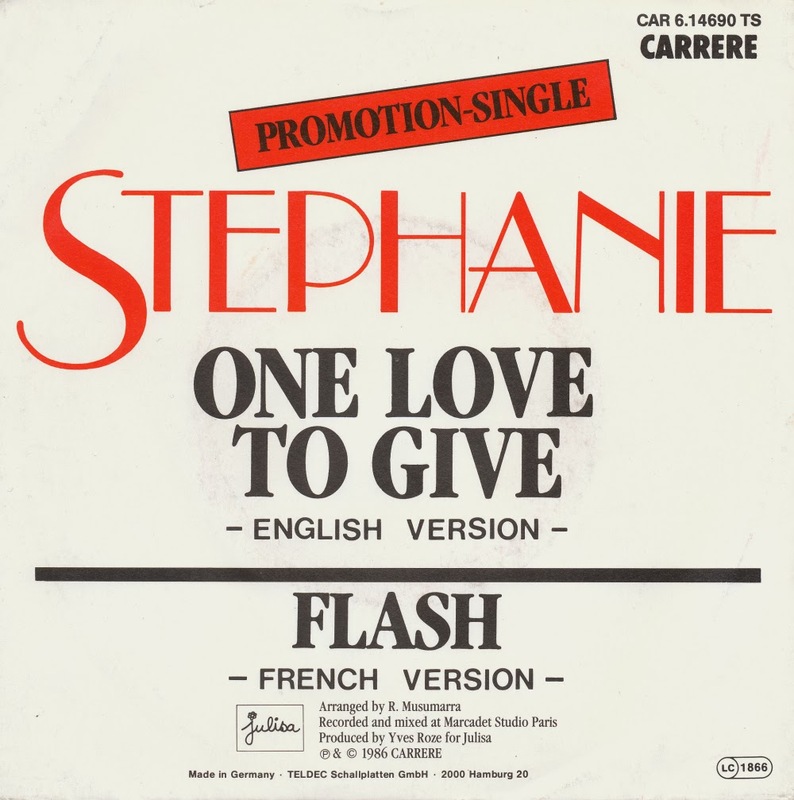 But here I was, finding a copy of Princess Stephanie of Monaco's 'Flash', the French version of 'One love to give'. As described in that post, this single reached number 4 in France and number 28 in Switzerland. Due to the similarity of the sleeve I doubted for a moment whether or not I had this single already. I'm glad I decided to take it with me just in case. Turns out I really didn't have this one! 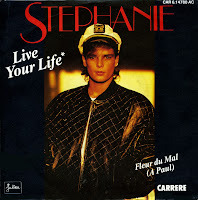 While elsewhere in Europe the single 'Live your life' was released, French-speaking countries preferred the track 'Fleurs du mal' as a single. It was a hit in France, peaking at number 16. Meanwhile, the album 'Besoin' sold more than 2,5 million copies. 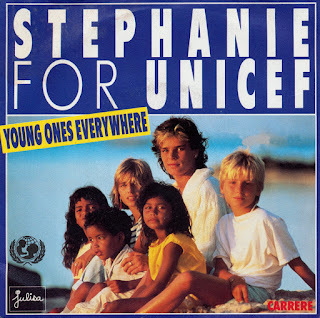 That same year, Stephanie released the single 'Young ones everywhere' to benefit UNICEF. 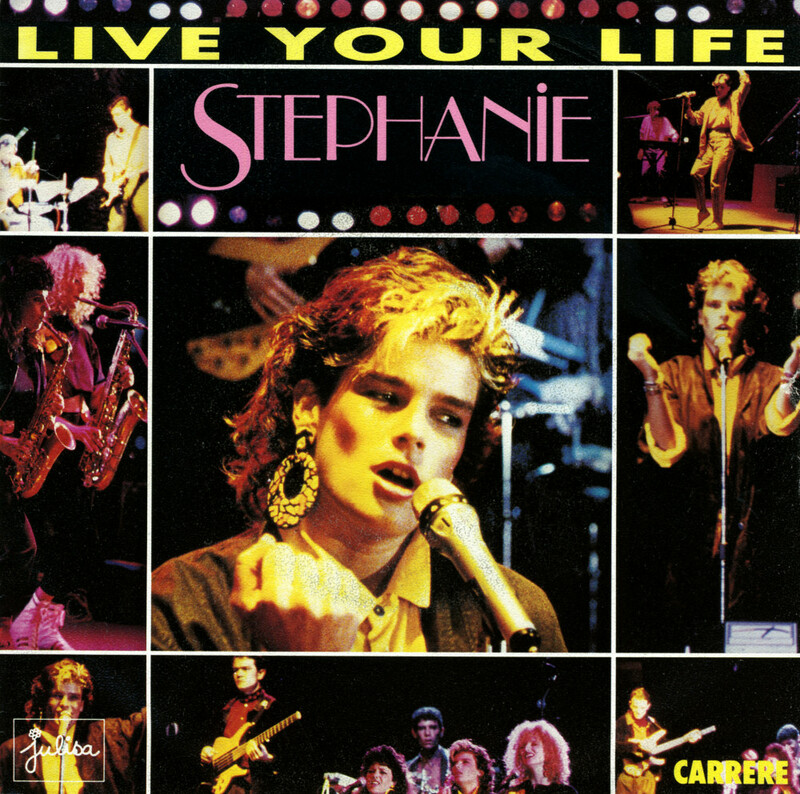 Released as the third single from Stephanie's first album 'Besoin', 'Live your life' was remixed by a certain Dimitri. Although French-speaking countries favoured the B-side 'Fleur du mal', this single was arguably a bigger success. 'Fleur du mal' only charted in France, peaking at number 16, whereas 'Live your life' went to number 9 in Norway. No further chart performances are known. Stephanie's music career ended just as soon as it had began - although she would still release a single called 'Winds of chance' in 1991 and perform vocals on Michael Jackson's 'In the closet' in 1992 - although she was not credited for this, but rather called a 'mystery girl'. More than the previous single 'Ouragan/Irresistible', 'One love to give' showed the vocal inadequacies of Princess Stephanie of Monaco. 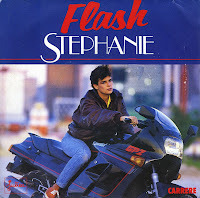 With a synth-heavy backing (which was so popular in the Eighties) and a rather strong composition, Stephanie wasn't able to keep up. But still she was rewarded with a number 1 hit in Sweden and a number 10 placing in the German singles chart. French speaking countries preferred the version in their own language: 'Flash' went to number 4 in France and number 28 in Switzerland. Royalty are usually old and boring, even the young ones. But Princess Stephanie of Monaco is an exception to this rule: she was a swimwear designer, a fashion model and a singer. She released her debut album 'Besoin' in 1986, a collection of Europop songs, with 'Ouragan / Irresistible' as the first single taken from that album. The song was written by Romano Musumarra, who had already written hits for French singers Jeanne Mas and Elsa. He actually offered 'Ouragan' to Jeanne Mas, but after she declined, he decided to offer it to the princess. The single was a number 1 hit in France, where it topped the chart for two months. In Germany it peaked at number 2, and in the Netherlands it reached number 31.